The DREAM study tested fish oil versus olive oil (placebo) for addressing dry eye. Dry eye symptoms and signs improved in both fish oil and olive oil users during the study, though improvement was not significantly different between the groups. The study's design allowed users to continue with or change their dry eye therapies during the study, an approach with both benefits and potential drawbacks. While a placebo other than olive oil might have been less controversial, the reason for improvement in the placebo group is difficult to know with certainty. The DREAM study findings do not apply to GLA (used in ScienceBased Health's supplement, HydroEye) since GLA is not found in fish or olive oils. Other clinical research suggests possible benefits of GLA for dry eye. Supplementation with high dose fish oil or olive oil helped alleviate the symptoms and improve objective signs of dry eye disease (DED) similarly, according to the results of the multi center DRy Eye Assessment and Management (DREAM) trial published in the April 13th issue of the New England Journal of Medicine (1). The randomized controlled trial examined the effect of fish oil (2,000 mg EPA and 1,000 mg DHA daily) or refined olive oil (5,000 mg daily, intended as a placebo) as an adjunct therapy in DED over a 12-month period. Three hundred twenty nine patients in the omega-3 group and 170 in the olive oil group were included in the primary analysis. The primary outcome of DED symptoms (measured by the Ocular Surface Disease Index or OSDI), improved in both treatment groups. The mean change from baseline for OSDI scores was 13.9 points in the omega-3 group. This was slightly better than the mean change of 12.5 points in the placebo group, though the difference between groups was not statistically significant. Overall, 61% of the omega-3 group and 54% of the control group achieved at least a10-point reduction in the OSDI score—a reduction considered sufficient for noticeable symptom improvement by patients. Between group differences in OSDI score changes were also tested in pre-specified subgroups for severity of symptoms, severity of signs, EPA and DHA red blood cell levels and ocular inflammation. The effect of omega-3 vs. olive oil supplementation on OSDI scores did not differ among these subgroups. Likewise, no significant differences between groups were seen for secondary outcome measures of mean changes in DED signs, including conjunctival and corneal staining scores, tear break-up time (TBUT) and Schirmer’s test. With the exception of Schirmer’s test results, TBUT and both staining scores improved significantly (p<0.001) in both the fish oil and olive oil groups. The trial was structured to model “real world” conditions by allowing participants to continue with or change the current DED therapies they were receiving, such as artificial tears, prescription cyclosporine drops, warm lid soaks and fish oil supplements if less than 1,200 mg EPA + DHA daily. This study design, based on the premise that omega-3s are most often used as an add-on intervention rather than as a single therapy, could be seen as introducing multiple con-founding factors. The potential confounding is somewhat mitigated by randomization, however, in that the use of each additional specific therapy appears to be fairly equally distributed across the active and control groups, and about the same percentage of participants in each group reported a change in therapies during the trial. Due to its anti-inflammatory properties, some have questioned the choice of olive oil as the placebo in this trial, suggesting that the improvements seen in the olive oil group were not due to the ‘placebo effect’ but to the activity of the oil in itself. The anti-inflammatory activity of olive oil due to its phenolic components such as hydroxytyrosol and oleocanthal, would not apply in DREAM since the study used refined (very low phenolic content) rather than virgin or extra olive oil (high phenolic content) (2). The predominant fatty acid in olive oil is oleic acid. Studies have found that substituting a modest amount of oleic acid for saturated or trans-fatty acids in the diet, leads to a significant decrease in IL-6, a pro-inflammatory cytokine and biomarker used in DED. Oleic acid does not promote inflammation, and may actually offset the pro-inflammatory effects of a high-fat diet, or the pro-inflammatory effects seen with the substitution of saturated or trans-fatty acids (3). Evidence from a clinical trial suggest that increasing oleic acid intake may replace “pro-inflammatory” arachidonic acid in LDL particles, and raises the possibility that this occurs in some cell membranes (4,5). However, in the earlier DREAM feasibility study, subjects taking placebo showed no significant change in red blood cell (RBC) membrane fatty acid composition (6), and the mean RBC oleic acid changed by less than 1% in placebo or fish oil groups in the DREAM study itself. Olive oil also contains a small amount of palmitoleic acid (0.3 to 3.5%), a fatty acid with anti-inflammatory properties. In a murine model of dry eye, oral palmitoleic acid was reported to preserve tear secretion and suppress inflammatory cytokines in the lacrimal gland (7). Though it’s not likely that the amount of oleic or palmitoleic acids from olive oil administered in the DREAM trial would have led to the observed DED benefits in the olive oil group, the selection of another oil for as the control may have been preferable and less controversial. While the DREAM study has cast doubt on the usefulness of high dose fish oil as an adjunctive therapy in DED, the results do not extend to the effectiveness of the fatty acid gamma-linolenic acid (GLA) in addressing this condition. (GLA can be converted to compounds that have potent anti-inflammatory effects, and some research has found that it is beneficial in diseases such as rheumatoid arthritis, possibly by acting on T-cells to modulate the immune response). GLA (alone, or along with modest amounts of EPA and DHA) has been studied more extensively than high dose omega-3 in DED, and shown to improve dry eye signs and/or symptoms. The purpose of adding EPA to GLA-supplemented diets is to prevent accumulation of arachidonic acid, and thus to decrease levels of pro-inflammatory prostaglandin E2 produced from arachidonic acid. Such a combination of fatty acids and other nutrients (HydroEye) was evaluated in a 6-month randomized, controlled, double blind trial in post-menopausal women with aqueous deficient DED. Compared to placebo, the formulation significantly improved symptoms, suppressed markers of conjunctival inflammation, and maintained corneal smoothness. The DREAM trial used conjunctival impression cytology to measure HLA-DR as a biomarker for ocular inflammation at baseline only as a means of defining subgroups for analysis. In the trial examining HydroEye, the inflammatory markers HLA-DR and CD11c were measured at the study’s start and conclusion. HydroEye was found to arrest inflammation, which continued to progress in the placebo group throughout the study period (8). These findings are consistent with other DED trials that evaluated the effects of GLA alone, or in combination with EPA/DHA. For example, GLA, unaccompanied by fish oil, has been found to alleviate dry eye symptoms, increase tear production and improve contact lens discomfort in those with contact lens-associated dry eye (9); reduce ocular surface inflammation in those with Sjögren’s syndrome (10); and, along with eyelid hygiene, to decrease eyelid margin inflammation and improve symptoms in meibomian gland dysfunction more than either treatment alone (11). GLA in combination with EPA/DHA has been shown in a randomized controlled trial (RCT) to reduce HLA-DR expression in patients with DED (12); to improve TBUT and relieve symptoms in DED, whereas the addition of topical cyclosporine drops did not add any additional significant improvement (13); and in another RCT, to offer an additional therapeutic advantage in patients with ocular dryness and already treated with lacrimal subsitutes (14). Dry Eye Assessment and Management Study Research Group. 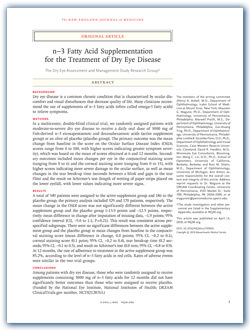 n-3 fatty acid supplementation for the treatment of dry eye disease. NEJM. April 13, 2018. Gorzynik-Debicka M et al. Potential health benefits of olive oil and plant polyphenols. Int. J. Mol. Sci. 19: 547, 2018. Basu A et al. Dietary factors that promote or retard inflammation. Arterioscler Thromb Vasc Biol. 26:995-1001, 2006. Cicero AF et al. EUROLIVE Study Group: Changes in LDL fatty acid composition as a response to olive oil treatment are inversely related to lipid oxidative damage. The EUROLIVE study. J Am Coll Nutr. 27:314–320, 2008. Hostmark A and Haug A. Percentages of oleic acid and arachidonic acid are inversely related in phospholipids of human sera. Lipids in Health and Disease. 12:106, 2013. Nakamura S et al. Restoration of tear secretion in a murine dry eye model by oral administration of palmitoleic acid. Nutrients. 9:364, 2017. Sheppard JD Jr. et al. Long-term supplementation with n-6 and n-3 PUFAs improves moderate-to-severe Keratoconjunctivitis Sicca: A randomized double-blind clinical trial. Cornea. 32:1297-304, 2013. Kokke KH et al. Oral omega-6 fatty acid treatment in contact lens associated dry eye. Cont Lens Anter Eye. 31:141–46, 2008. Aragona P et al. Systemic omega-3 essential fatty acid treatment and PGE1 tear content in Sjogren's syndrome patients. Invest Ophthalmol Vis Sci. 46:4474–79, 2005. Pinna A et al. Effect of oral linoleic and gamma-linolenic acid on meibomian gland dysfunction. Cornea. 26:260–64, 2007. Brignole-Baudouin F et al. A multi-centre, double-masked, randomized, controlled trial assessing the effect of oral supplementation of omega-3 and omega-6 fatty acids on a conjunctival inflammatory marker in dry eye patients. Acta Ophthalmol. 89:e591-7, 2011. Jackson MA et al. Efficacy of a new prescription-only medical food supplement in alleviating signs and symptoms of dry eye, with or without concomitant cyclosporine A. Clin Ophthalmol. 5:1201-6, 2011. Creuzot-Garcher C et al. Efficacy assessment of Nutrilarm®, a per os omega-3 and omega-6 polyunsaturated essential fatty acid dietary formulation versus placebo in patients with bilateral treated moderate dry eye syndrome J Fr Ophtalmol. 34:448-55, 2013.